Lillooet is just off Highway 1 heading west from Kamloops, and is known for its scenic vistas. Its mountain ranges rival those of Whistler and Banff, but don’t come with the tourist crowds and price tags. At 250 meters above sea level, these altitudes will have mountaineers, hikers, geocachers and paragliders flying high. 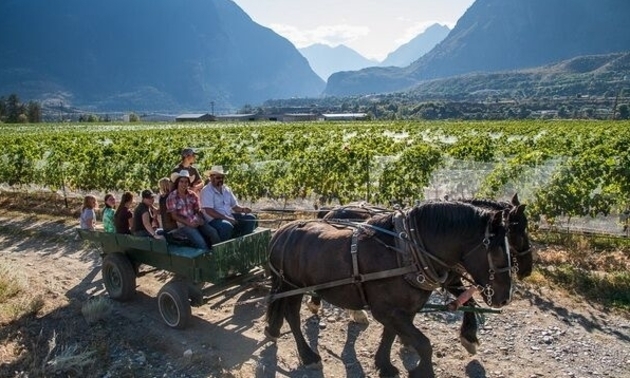 The district of Lillooet has a recreation centre, a winery, several ranches and a farmers market to visit during your stay. Lillooet is a popular haunt for fishing and boating enthusiasts, as there are many waterways throughout the area. Many of these locations feature campgrounds perfect for the average RVer’s immersion into nature. Climate: Lillooet offers its best camping weather between late April and early October. The hottest average temperature for this region is in August. Lillooet usually receives most of its rainfall between March and June. District of Lillooet: This site hosts most of Lillooet’s tourism information, and maps on how to get there. Lillooet has a lot to offer in addition to its mountain views and great camping locations. Here are a few places to see and explore while you’re spending time in Lillooet. A self-guided tour of Lillooet’s most historical locations. What was once a gold-rush epicentre is now a small town loaded with history. Lillooet’s first winery, Fort Berens Estate, opened in 2009. The estate covers 65 acres, and has a tasting room that’s open year-round. The Lillooet REC Centre has the usual amenities with the addition of a climbing wall and bouldering gym, catering services, squash court and a 25-metre long, six-lane pool. Part of Marble Canyon Provincial Park, Pavilion Lake hosts exciting activities like fishing and scuba diving. The lake’s recorded depth is 65 meters, and it is home to some of the world’s only microbialites (a type of coral-like structure believed to be one of the oldest on earth). NASA has teamed up with the University of British Columbia to study these formations, so diving is only allowed in certain areas of the lake to avoid disrupting any scientific monitoring technology. The market runs every Friday morning at 8:30 a.m. from May to October. Fresh produce and unique handmade items are available for sale. Grass-fed B.C. beef is available biweekly. July 20 to 22, 2018; musical guests perform at 6 p.m. July 21. The event will feature the local farmers market, local restaurants, a quilt show and family activities. Contact: Lillooet City Hall will be able to answer any questions about the festival.